Wow. This is, unfortunately, a rare event. 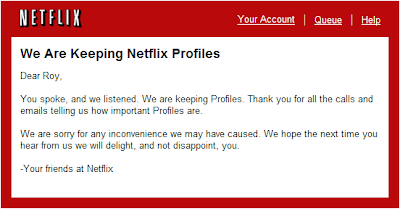 Netflix was adamant that the Profiles feature was going away, but they heard their users and reversed course. My kids, who told me that the Netflix explanation made "absolutely no sense," will be quite happy. I still don't buy their explanation, but I guess it doesn't matter anymore. Now I can start thinking about that Roku box again. Bravo!